Franciscan Estate: Franciscan Estate Cabernet Sauvignon �The Franciscan Estate Cabernet Sauvignon:Deep garnet with a lovely plum nose and rich fruit with layers of complexity. 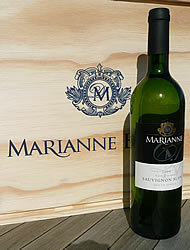 Hints of licorice, vanilla, blackberry, tobacco, and leather envelop the fruit. Ripe entry of cherries and cassis showcases a full, well-structured palate. Textured and rich, the mouthfeel is balanced and generous showing layers of ripe berries, black pepper, mocha, and spice. A very long finish that leads you to another sip. https://www.weinbaule.de/red-wine-usa-franciscan-estate-cabernet-sauvignon-p-2547.html?osCsid=a9901798686ee02c233b6b784c27e7a0"> Wine 29.99 08308520022 WeinBaule.de | The Home of Wine Franciscan Estate New In stock!